Hives are raised, often itchy, red bumps (welts) on the surface of the skin. 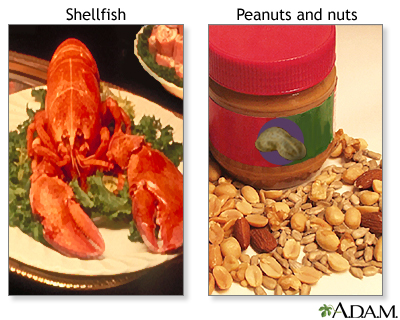 They can be an allergic reaction to food or medicine. They can also appear without cause. When you have an allergic reaction to a substance, your body releases histamine and other chemicals into the blood. This causes itching, swelling, and other symptoms. Hives are a common reaction. People with other allergies, such as hay fever, often get hives. Angioedema is swelling of the deeper tissue that sometimes occurs with hives. Like hives, angioedema can occur on any part of the body. When it occurs around the mouth or throat, the symptoms can be severe, including airway blockage. Swelling of the surface of the skin into red- or skin-colored welts (called wheals) with clearly defined edges. Wheals may get bigger, spread, and join together to form larger areas of flat, raised skin. Wheals often change shape, disappear, and reappear within minutes or hours. It is unusual for a wheal to last more than 48 hours. 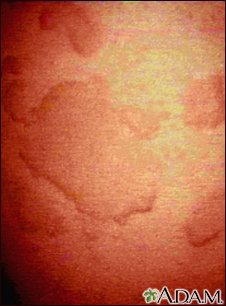 Dermatographism is a type of hives. It is caused by pressure on the skin and results in immediate hives. Your health care provider can tell if you have hives by looking at your skin. If you have a history of an allergy causing hives, for example, to strawberries, the diagnosis is even clearer. Sometimes, a skin biopsy or blood tests are done to confirm that you had an allergic reaction, and to test for the substance that caused the allergic response. However, specific allergy testing is not useful in most cases of hives. Do not wear tight-fitting clothing, which can irritate the area. 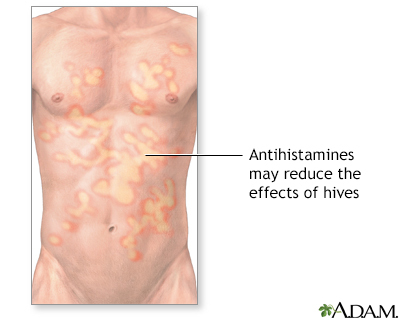 Your provider may suggest that you take an antihistamine such as diphenhydramine (Benadryl) or cetirizine (Zyrtec). Follow your provider's instructions or the package instructions about how to take the medicine. Other oral prescription medicines may be needed, especially if the hives are chronic. If your reaction is severe, especially if the swelling involves your throat, you may need an emergency shot of epinephrine (adrenaline) or steroids. Hives in the throat can block your airway, making it difficult to breathe. Hives may be uncomfortable, but they are usually harmless and disappear on their own. When the condition lasts longer than 6 weeks, it is called chronic hives. Usually no cause can be found. Most chronic hives resolve on their own in less than 1 year. Call your provider if the hives are severe, uncomfortable, and do not respond to self-care measures. To help prevent hives avoid exposure to substances that give you allergic reactions. Saini SS. 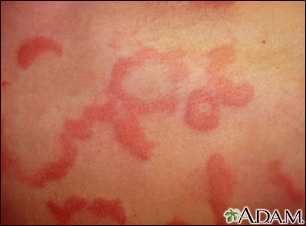 Urticaria and angioedema. In: Adkinson NF Jr, Bochner BS, Burks AW, et al, eds. Middleton's Allergy: Principles and Practice. 8th ed. Philadelphia, PA: Elsevier Saunders; 2014:chap 36. Hives develop when histamine is released into the small blood vessels (capillaries). The capillaries dilate which causes a welt, and fluid oozes into the surrounding tissue, causing swelling. Histamine also causes intense itching. 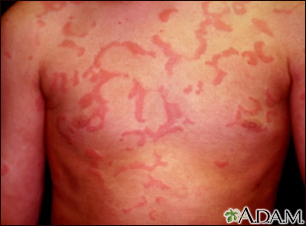 The hives (urticaria) on this person's chest have the typical slightly-raised red appearance and are accompanied by itching. Hives can be generalized over the entire body or may be localized. 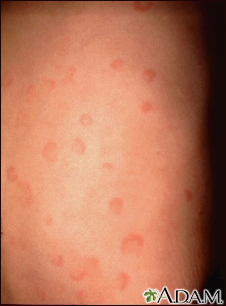 These are hives (urticaria) with the typical slightly-raised red appearance, and are accompanied by itching. These are located on the buttocks. Hives can be generalized over the entire body or may be localized, and usually result from an allergic reaction. 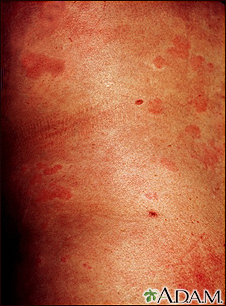 The hives (urticaria) on this person's back have the typical slightly-raised red appearance and are accompanied by itching. Hives can be generalized over the entire body, or may be localized. 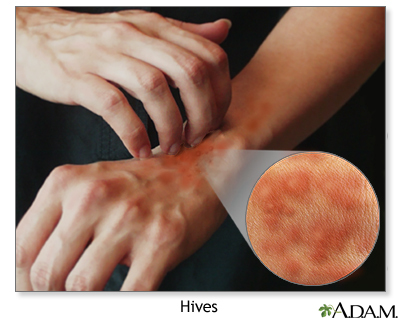 Hives are raised red welts of various size on the surface of the skin, often itchy, which come and go. Also called uticaria, hives is usually part of an allergic reaction to drugs or food. The term "dermatitis" describes an inflammatory response of the skin, caused by contact with allergens or irritants, exposure to sunlight, or by poor circulation, even stress. AVOID SCRATCHING. Scratching the rash may spread the inflammation, lead to infection and even leave scars.